Once nick named “Woody”, after Woody Guthrie, for her crazy, silly song leading. She has so many camping skills that if you were lost in the forest, you would want her to be there with you! Dawning her dancing shoes since she was a toddler, Doreen Fineman was basically born to dance. By age three she was already dancing foxtrot, swing and rumba with her first partner (her dad), and knew that she wanted to be a dancer. While growing up she enrolled in every dance class that was available to her; taking modern, jazz, tap and ballet. While earning her California teaching credential at UCLA, Doreen fell in love with ballroom dance, and her dance partner-soon to be husband Ken, whom she met in dance class. In addition to ballroom, together, Doreen and Ken participated in international folk dance, and even joined a Greek dance troupe! They continued to train with Arthur Murray, Fred Astaire another studios. After college she worked as a special education and fifth grade teacher while raising her two daughters. She was also once president of two major charity groups. In 1992 Doreen made a serious return to the ballroom world with serious training and competitions for about a decade, then decided to start teaching dance. She hasn’t looked/turned back since. 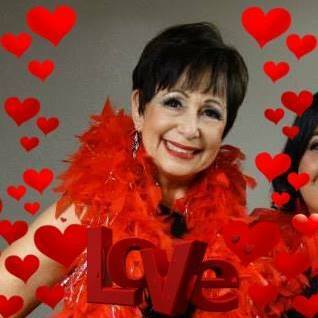 Doreen’s dance specialties include: waltz, foxtrot, tango, quickstep, Viennese waltz, rumba, cha cha, bolero, samba, mambo, East coast swing, and Nightclub 2 Step. Doreen admits that she’s like to try Hip hop and Carolina shag dancing sometime. Some of her favorite dances are bolero and rumba songs by Andrea Bocelli and Luis Miguel. She also loves foxtrots with attitude by Frank Sinatra, Dean Martin and more. Some of Doreen’s other hobbies are cooking, and learning to make jewelry. She used to make stained glass, and enjoys cake decorating, quilting and sewing. -Although she has terrible eyesight, she’s an excellent shot with a firearm! -She was the fastest runner (boy or girl) in her high school. -Super power she’d like to have: To be in two places a one time. (Although her husband says that’s not a super power)! -She has always loved math and aced the math section of the SAT, and even entered UCLA as a math major. -When she was in the 2nd grade, she won a swing contest with her older brother, and did aerials. -She was a high school girl scout leader for 20 years, and took the scouts to Australia, Canada, Ireland, Scotland, Wales, Hawaii and more. Her admitted guilty pleasure is that she’s a Candy Crush addict. “I run out of levels to play every couple of weeks! Even the makers of Candy Crush recognized my achievements by sending me a FREE Candy Crush edition of Monopoly!!! I believe they said that there were only 400 people that were getting it. That was a surprise.” she excitedly explained. When students take her classes, Doreen states that she hopes that they will gain the belief that they can do this. “So many people have no confidence when it comes to dancing. I want to light a fire within them that grows into a love of dance,” she added. When asked how dancing has changed her life, Doreen paused and thought for a moment, then answered, “Wow… Dancing is a huge part of my life. Dance is great way to relieve stress, challenge your brain and body, stay healthy and meet new people. It’s how I met my husband, and that certainly changed my life! It has given me confidence, skills and the desire to share dance with others.” And just as dance has changed Doreen’s life, she continues to positively impact the lives of her students through dance every day. You can take group and private lessons with Doreen at ATOMIC throughout the week, where she teaches a number of different ballroom classes at levels ranging from beginning to advanced. Doreen and Ken also host and DJ ATOMIC’s ballroom dance social every Saturday from 8:30PM until around midnight. Students can practice what they learned right after class, while getting to mingle with dancers from near and far, while being encouraged by Doreen’s enthusiasm and lifelong commitment to dance.